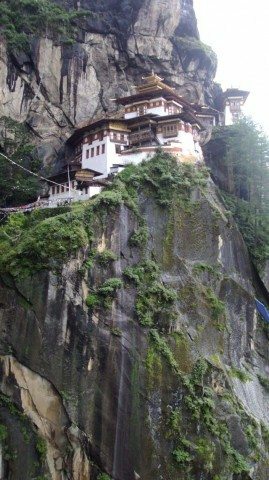 Taksang Gompa: A Holy Trek in Bhutan - Ghumakkar - Inspiring travel experiences. The first view of Taksang Gompa, from the approach road towards the end of Paro valley can only be described as awesome. As I looked up towards the distant, peaks, half engulfed by mist rising from the valley below, the shrine buildings looked like two whitish dots almost like eyes carved on the vertical rocky cliff. As I focused, it looked more like the head of a giant “yeti” staring down towards the valley with menacing eyes. The top of the cliff with scattered tree line almost resembled the head of the “Yeti” of my wild imagination. The rising mist surrounding the cliff in patches added to the eerie atmosphere. It looked cold, distant and menacing. 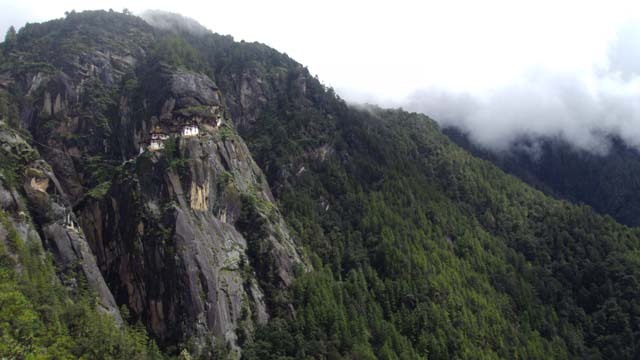 That was Taksang Gompa, perched on a cliff face, like two white specks stuck on the vertical rock by magical glue. I had first seen its photograph in a forwarded email in 2004, as one of the ten most precariously placed shrines in the world. It was so captivating that very moment I told myself that I would be there one day. That day was to be 16 Sep 2012. As we drove further up into the jungle along a mud track, the two dots cliff hanger appeared and disappeared from view through the tall pine trees. Finally we approached a clearing, a flat ground with more spaces between the interspersed pine trees. There were two SUVs parked and few Bhutanese men moving around. Two wooden huts built on a platform looked like make shift office. As the track ended here the place turned out to be the base for onward journey to the holy Gompa. I could see Taksang Gompa far up above looking more distant and dangerously vertical. The base, almost hidden within the pine trees served as a parking area for few vehicles, horses and mules. Morning sun filtered and sprayed through the thick canopy of pine trees touching the wet ground that was full of dry fallen leaves. The air was forest fresh and the gurgling sound of stream meandering down the mountain accentuated the freshness. The place was quite except for the natural sound of scratch and scamper of squirrel or starling rush of a magpie that flew overhead in a hurry. I approached a Bhutanese man in his traditional attire “Gho” and asked him about the route to the Holy Shrine above. 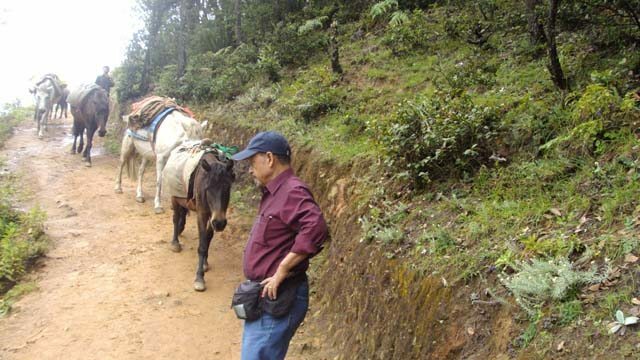 He indicated and explained that the trek route was the mule track spiraling up the mountain to Taksang Gompa. Seeing the parked SUVs I enquired if anyone had gone up that morning, I was pleasantly surprised to learn that no other than Her Highness; the young Queen of Bhutan herself had taken the route to Taksang Gompa early morning to offer prayers. Unlike the ever present red light gleaming, siren screaming cars, posse of gun wielding black cat commandos, hangers on and sycophants creating a big hullabaloo being the usual scene of a big or small time VIP visits in India, the place was quiet, peaceful and serene with no trace of the Queen having been there and would be there again upon her return. A lesson, if it may be, for Indian VIPs on humility and simplicity by the young, beautiful, well-educated and well-bred silent queen. The queen’s small entourages had quietly left on horseback for the holy shrine early morning. A small group of drivers and staff with 2 SUVs were waiting for her to return. I admire this young queen, recently married to the Oxford educated young king, His Highness, King Jigme Keshar Namgyal Wangchuk. A young and handsome couple made for each other and their small Himalayan Kingdom. God Bless them and their Shangri-La kingdom. We set out for the trek, carrying back packs with water, biscuits and fruits. We crossed the stream, stepping on the stones placed for the purpose, and started climbing uphill. The track was initially gradual ascent over wet ground, spiraling up through the pine forest as it appeared and disappeared along the bushes and trees, playing hide and seek. A Bhutanese man sitting under a tree with couple of ponies grazing around yelled at us offering to rent his pony for the climb @ INR 1000.00. We politely refused and moved on. The path was indeed the mule track with few short cuts, spread like exposed roots of a giant tree, made by the locals. Such short cuts are usual all over the hills. We kept to the mule track and mostly avoided the steep short cuts. A group of playful young boys and girls came rushing up and overtook us, laughing, giggling and shouting as they did. The track became steeper and our movement slower. We trudged on, one foot forward at a time. A pack of load carrier mules with their drivers crossed us on their way down; leaving fresh dung on the track that was immediately attacked by green flies. It looked natural and not at all dirty, a part of the jungle trail. Some more local families overtook us and surged forward at a fast pace, almost a routine walk for them. I wanted to keep my own steady pace using the umbrella as walking stick. At the age of 68, one needs to listen to one’s body and not rush to compete with others. We pushed every step, slow and steady and continued climbing. My thigh and calf muscles started aching demanding rest. As we kept climbing my breathing became harder and started roaring into my ears. We trudged on. The mountain breeze, when it came, helped me like a breath of fresh air. A crow hovered upwind in search of a prey perhaps. The climb became grimmer as we continued to angle towards the top. My shirt, which had been soaked with sweat, now felt stiff and uncomfortable. I wiped the perspiration from my forehead that was trickling into my eyes. I glanced at the rock face towards my right and saw the holy Gompa across that looked like toy houses stuck together on the rock face with glue. It became bigger as we climbed further up and reduced the distance with the rock face. We pushed slowly with no sense of hurry. The aroma of the jungle was printed on every whiff of breeze that I savored. 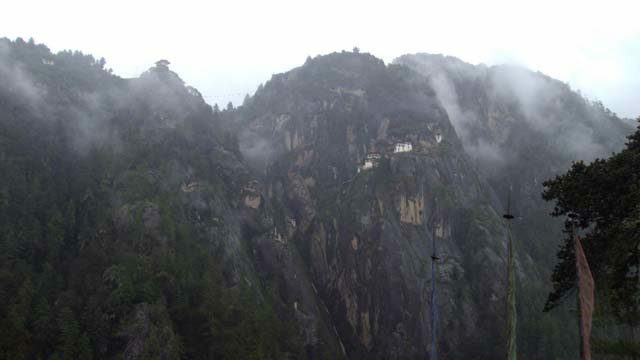 The mist rose from the valley below and started blotting out the tumbled slopes of the rocky cliff below the Gompa. After about an hour and a half we reached a midpoint, rested and sipped water. It would be unwise to rest for too long as once the body gets cold it will be difficult to climb up, better keep the body warm and maintain the rhythm of the climb. We came across a young and smart Bhutanese man working for a tour company. We chatted and took photograph for remembrance, a smiling mountain man as ever. As we walked on and reached higher ground we could see the majestic Taksang Gompa through the trees, perched like a bird’s nest on a vertical cliff. More we saw it from closer distance more precariously placed it looked. Half way up the hill and about two hours climb we reached a plain area with rows of prayer wheels under a small tin roof. Pilgrims, both locals and tourists were resting on their way up and down. Young Bhutanese boys were playing innovative cricket with stone wicket and locally made bat and ball. The cricket fever has reached nooks and corners of the mountains without sparing any community and people. Across the plain area and prayer wheels was a rough wooden signboard written “Cafeteria” indicating the way across a gate. It felt good to see the sign board, tempting to change direction to relish a hot cup of tea, but we walked on towards our destination. The path flattened for some time and we could see some houses far above, a small village. We came across a clear water stream gurgling down across the path. 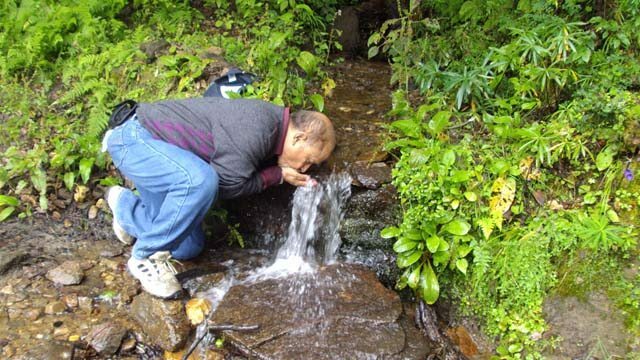 We drank straight from it, sweet water of mountain spring untouched by pollution created by civilization. I pray such purity in small doses stay forever in these mountains. At the end of the flat stretch of the track I saw a huge conical rock and a slab of huge flat stone. A young man was sitting on the slab, his back towards us. As I reached the Conical Stone, I realised it was the view point offering a crystal clear view of Taksang Gompa across the deep gorge that separated us and the vertical rock face holding Taksang Gompa. It was an awesome sight, The Holy Gompa in real just in front of me stuck on the rock face. It is known by the name “Copper-Colored Mountain Paradise of Padmasambhava”. It was just like the numerous photos I had seen, a dream like experience that will be etched in my memory for ever. This is the view point for visitors below which there is a small cafeteria to provide refreshments. The trek beyond this point is very scenic with the sound of the water fall breaking the silence. Along the trek route prayer flags strewn across the gorge between the View Point Mountain and the Taksang Gompa side of the cliff add spiritual beauty to the place. I sat on the stone slab, touched the conical stone, imbibing the calm and serenity of the place, my tiredness and aching limbs vanished. Here the air was fresh and clear with all the crispness of high peaks and a sense of limitless distance. It had taken us 3 hours to get to this view point from the base. The last lap was the toughest; from the view point we had to go down about 500 feet along almost vertical cemented steps with hand railings, mercifully. Down below, at the end of the descent was Small Bridge over which cascaded a water fall from more than 1000 feet above. Against the grey verticality of the cliff, strand of milk like water continuously vanished into misty smoke atomized by the never ending crash on to the rock below and reappeared again in reconstituted form of liquid water that continued to flow down the gorge in an endless pursuit of nowhere. I could not take my eyes off this miracle of water. 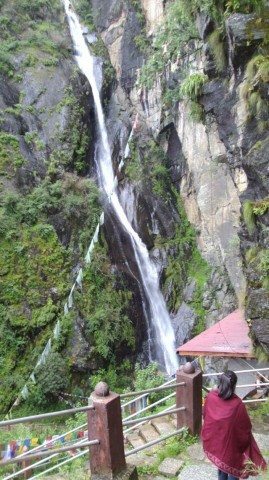 We are so fascinated by the flow of water that we stare fixedly at it for prolonged period of time, never getting tired of seeing, whether it is sea, river, waterfall, fountain, pond, lake or a small stream. Strange, as it may seem but we seem to be biased towards fascination with water against land. It is odd because the land is varied, colorful and endless as against the consistency of water. The bias may be so because water is in a state of constant movement while the land is static and the movement of land or the movement of leaves and branches of trees as also the movement of earth’s crust is imperceptible to us. It is this visible movement of water particles whether in the form of concentric ripples on a lake or the rumbling fall on the rocks that defines the purity of water with vibrant impulse. That is why water is water, the essence of life. We started the steep descent of steps slowly holding the hand rails thoughtfully built for the aged and tired piligrims. We passed many visitors, Bhutanese, Indians, Japanese and other nationals. As we reached the foot bridge we were covered by never ending spray of misty foamy water from the water fall. It was a heavenly experience, tired as we were; the cooling effect was mentally and physically soothing. I could have stayed there forever. After crossing the footbridge passing through the gauntlet of misty spray we reached the ascending flight of equally steep steps rising up towards the Holy Shrine, the final climb for the final destination. After climbing the trail for three hours and reaching an altitude of 10000 plus feet I was so tired that I could only move forward one step at a time holding the hand rails. If I am tired I am tired, I am aware of the tiredness and revolting muscles of my body. Awareness is important, it is like going inside one’s body and knowing, that takes the pain away. The fact that I ventured to undertake this trek was good enough for me, to bite what I could chew, defining aim that can be achieved. To know how far one can stretch the body up to and little beyond the limit of endurance. To this thought I fit in my own philosophy of life, “Age is a matter of mind, if you don’t mind, it does not matter”, let age not be a factor for what we wish to do and what we wish to achieve. It can be done. Finally we reached the formidable shrine, the Holy Taksang Gompa and I had finally realised my dream. As we stepped on the first platform of the Gompa there was a small make shift check post, manned by few RBP (Royal Bhutan Police) personnel where we had to leave our back packs, cameras, cell phones etc. No such thing as coupon and pigeonhole system. There were nails on the walls of the check post where visitors hung their bags. Having finished with the formalities of giving our names that a police man wrote on the crumpled dog eared register, we climbed on to the second platform. It lead to a dark tunnel like pathway under a roof that opened to a small open courtyard. I was aware that I was standing on the small ledge of the great cliff that served as this courtyard. Anther five steps and I would be at the very edge of the almost bottomless vertical cliff. I took those five steps and looked down and saw the vertical rock face down below. I quickly retraced my steps back. At the end of the courtyard, at ground level, stuck to the rock face was a door that led to a small cave like shrine. As I entered the door, I noticed that the left wall of the shrine had a small, window like closed door. 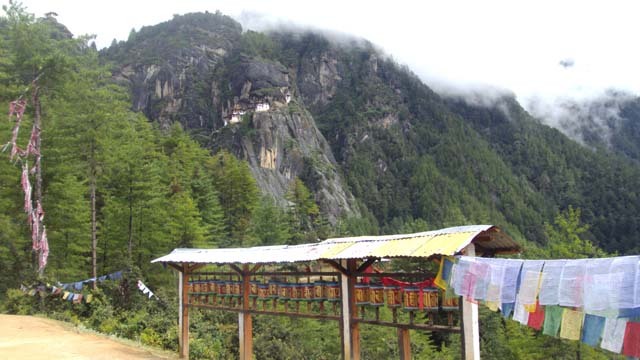 It was the door to the cave where Guru Rinpoche (Padmasambhava) had meditated in 8th century. The door was locked and I was told by a lama that it is opened only once a year. I touched my forehead on the ground next to the door and felt blessed. Upon coming out of the small shrine we were guided upstairs across a flight of narrow wooden staircase. At the first floor as I was ushered into the holy shrine. There was the main alter over which were placed the idols of Gautam Buddha, Guru Rinpoche and Maa Tara. Below on the second shelf were rows of “Chimies” or glowing butter lamps, next row were water offerings in small silver bowls. There were offerings of flowers, eatables such as biscuits, sweets, fruits and homemade “Khapsey”, (deep fried and hard bread in many folds), all neatly arranged on plates and wooden baskets on the high alter. The fine scented aroma of “Sang”, (holy essence) made by burning dry pine leaves and herbs in a metal container with chains to hold and swing, added to the holy fervor of the shrine. It was so bright and lively as if the spirit Guru Rinpoche was present. An elderly lama was sitting on a low cushioned platform opposite the main alter reading “holy Poshtak” (quatrains) written in “Zongkhar”, Bhutanese script, on rectangular papers, neatly arranged and bound by cloth and wooden slabs from the top and bottom. I sat next to the lama and asked for his blessings. Most kindly he blessed me by touching my head with his small prayer staff and gave me dark seeds that would have been blessed. I tried to prolong my stay inside the holy shrine as much as possible but I had to make room for other pilgrims. As we left the shrine we were given our share of Holy “Prasad” that included “Khapsey”, fruits and biscuits. Upon coming out we stepped down to the first platform there was a small pond of spring water that was materializing from under a huge rock. Like others I collected a bottle of this holy water and carried it along. It was with a deep sense of satisfaction, gratitude and spiritual feeling that I started descending down the steps to the foot bridge and up towards the view point. Although tired and knees creaking, I took photographs of the shrine and waterfall. Finally after what seemed like forever, we reached the view point. The small tea stall was nonfunctional at this point of time but I entered a small chapel adjacent and lighted 7 “Chimies” @ INR 45 per lamp and continued my ascent to the view point. This time the aim was to reach the cafeteria next to the Prayer Wheel area to try our luck with some hot food. It started drizzling but the elation and satisfaction of having reached Taksang Gompa was too high to worry about the drizzle or for that matter even a heavy rain. I had lived my dream. We reached the cafeteria that already had the Japanese group helping themselves over lunch buffet. The dining hall was a huge, almost 50 meters by 30 meters in size with a long table serving hot food and rows of Bhutanese style low divans with matching low tables called “Choksey” to keep plates and mugs. We paid INR 450 per plate and helped ourselves from the well laid buffet of vegetarian food. The bill of fare was steamed rice, lentil soup, different types of vegetables cooked in Bhutanese way in cottage cheese and Chilies. After the sumptuous lunch there was salty butter tea called “shuza” that we could have as many cups. We exited the cafeteria and I took more photographs of the holy shrine now surrounded by mist. After a quick visit to the loo we left the cafeteria and started back downhill. 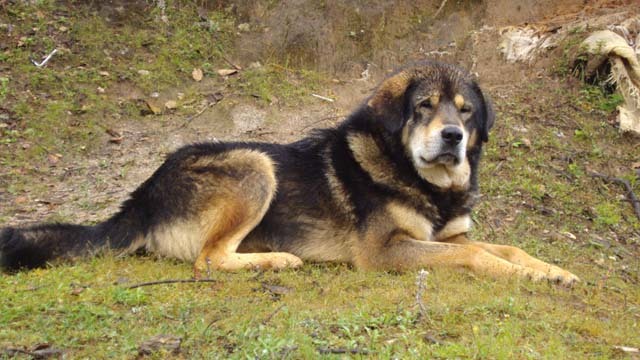 There was a huge Bhutanese mastiff sitting quietly under a tree near the Cafeteria not at all minding the drizzle or the people passing by. Its mood was somber to say the least, not at all hostile. I shot him with camera, said goodbye as he gave me an unconcerned look and we moved on. I seem to come across such dogs most of the places I visit, “Karmic” Connection. Trek back was comparatively easy; however we had to be careful of the slippery track with the continuing drizzle. It was heartening to see the group of young boys and girls running down the track, slipping, holding each other’s hands, giggling and shrieking. All very happy. A lone and elderly western lady was being helped by a young Bhutanese couple as they took careful steps down the slippery path. The Japanese group was also walking down alongside us, all happy and satisfied. Although it had taken us 3 hours plus to reach Taksang Gompa from the base, it took us only about one and half hours to return. As we crossed the clear stream of the base most of us rubbed the mud from our shoes on the watery stones. Finally we climbed into our Scorpio and drove back to the resort, a half an hour drive. That night we celebrated with a fine Bhutanese rum and coke that we had bought in Paro general Store. Next day we returned along the long highway back to Siliguri with lunch break in Jaigaon. It was a trip to remember for all times to come for we had lived our dreams of visiting the world’s one of the 10 most precariously placed shrines, Taksang Gompa. 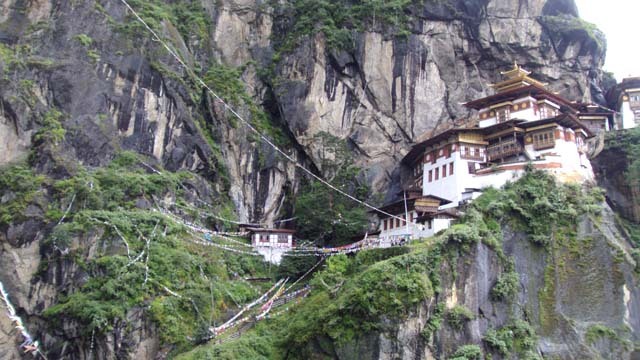 This holy shrine, Taksang is Spelt and pronounced in Tibetan as “Stag Tshang” meaning “Tiger’s lair”. As per the legend in 8th Century Guru Padmasambhava (Guru Rinpoche) flew to this location from Tibet on the back of his tigress consort so as to tame the Tiger demon. He meditated in the same cave for 3 months, 3 weeks, 3 days and 3 hours. Another legend says that a former wife of an emperor of Tibet Yeshe Tsogyal, willingly became a disciple of Guru Rinpoche, transformed herself into a tigress and carried the Guru on her back from Tibet landing on the cliff, which he “anointed” as the place for building a monastery. He established Buddhism and the Nyingmapa school of Mahayana Buddhism in Bhutan, and has been considered the “protector saint of Bhutan. After his meditation the Guru Rinpoche emerged in eight incarnated forms. Thereafter the place became holy and came to be known as the “Tiger’s Nest”. 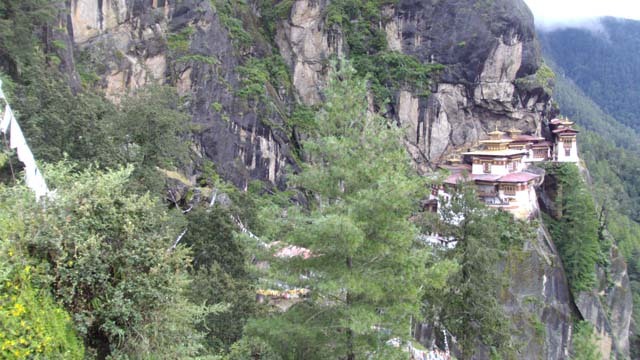 It is further believed that Taksang Monastery was built by King Tenzin Rabgye in 1692. 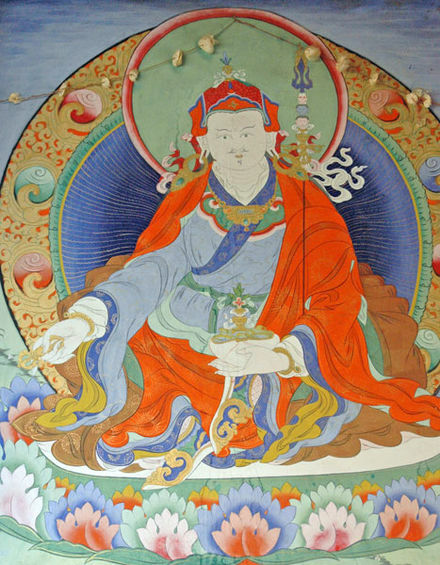 It has been mentioned by authors that it was Guru Padmasambhava who had reincarnated again in the form of Tenzin Rabgye. The monastery is located 15 kms North of Paro and hangs on a precipitous cliff at 3,120 M (10,240 ft.), about 900 M (3,000 ft.) above the Paro valley, on the right side of the Paro Chu (water). Though it looks formidable, the monastery complex has access from several directions; the North West path through the forest, from the South along the mule track generally used by visitors and tourists, and from the North, access over the rocky plateau, which is called the “Hundred Thousand Fairies” known as Bumda. On 19th April 1998, a fire broke out in the main building of the monastery complex, which contained valuable paintings, artifacts and statues. The fire is believed to have been caused by electrical short-circuit or a flickering butter lamps lighting the hanging tapestries. A monk also died during the fire. The restoration works were undertaken at an estimated cost of 135 million ngultrum (Bhutanese Currency). The Government of Bhutan and the then King of Bhutan, Jigme Singhye Wangchuk, oversaw the restoration of the damaged monastery and its contents in 2005. Brilliant post with very beautiful pics. The landscape of the area really looks exotic and outstanding. Wish to visit such a nice and calm place at least once in my life time. Thanx for sharing and writing a nice article..
What a motivating piece of writing! One feels like doing this trek straightaway, right now! Thanks for the lovely post Colonel. Hope to be reading about more such offbeat places from you… !! Happy travelling! Thank you Mani , for the rather interesting travelogue. Lovely snaps added to the ‘write-up’. After the first part, was waiting for the second(never received it), but now i have all three with your latest mail. Wonder, if i could have done the trek, when i was your age. Kudos to you. My forays to Bhutan were in my younger uniform days, limited to Eastern Bhutan , another very sparsely populated place. Would like to know if the east, n west are now connected by rd? Thank you Bardie sir for your kind comments. You have always inspired me since the summer of 1969, when I came to Fazilka for summer break from IMA and you took me to Sabuna Distributry area and made me dig trenches and taught me “Aam Rukh” and “Arch of Fire” : ), we have come a long way. I wish I could write about those days. Feels like yesterday. They are amazing – your spirited endeavours, the beauty that you describe and of course, your description. Yesterday, I was reading a list of most friendly destinations worldwide (HT ? ), and out of 10 places, 2 were Thimpu and Paro !! Thanks for this beautiful series on a beautiful place. Wow, Colonel saab, what an inspiring post! Have long been wanting to read your amazing tales, but was not able to somehow…:(…even left a comment on the first post of this series, but it disappeared strangely…:(…nevermind, the detailing in your post is superb (so are the photos), it sounds like as if we are travelling with you…amazing! The quotes are nicely picked up & placed to give the desired feel…& the way you compare the different aspects of 2 nations is really worth noticing & pondering like our VIPs V/s their VIPs…i second your views about water & admire the water (or water bodies) the way you do…in fact most of my posts are related to lakes or water bodies. Thank you Vipin, you inspire me and I take your compliments as a great honor. I am so happy that you are relishing Bhutan through my posts. I am sure you will get to visit this beautiful country soon. God Bless. i wirte this comment with a touch of jelousy . my 1940 model does not withstand such treks anymore. keep it up but take care of urself . did many more and took a beautiful trip up from tanakpur to the devi rocks in 78.
never knew that the devi rocks located on india tibet border was a beauty till we reached it . people prayed the rocks and has a small 9 ” statue. saw many aves with many yogi’s staying inside them . later i only could take my students on trek to singarchori and kala pahad of choral many times . khedarnath and vaishno devi were more pilgrimage than treks . i wish i could convert my jelousy into strength and join you in a next trip . Thank you very much for your kind comments, needless to say that your jealousy inspires me to do more of it. Mine is 1946 model, so far so good : ) There so much to travel, so much to see and so much to write about, as such, I am not so old man in a hurry : ). 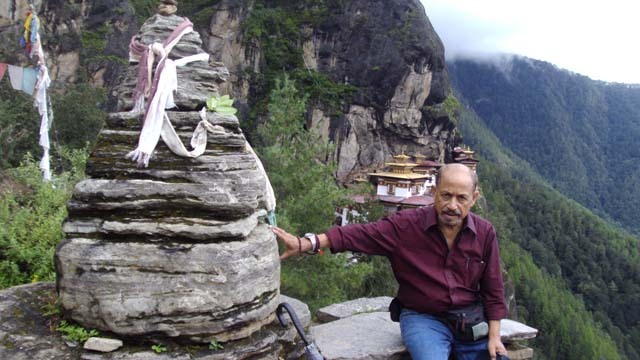 Do read my previous posts on Kalimpong and Namprikdang of Dzongu, North Sikkim. Mani Sir – Tagra Raho (I have no idea what it means but I would think that it is a way of greeting,hehe). What a inspiring tale. Thank you. This is an A-ha post! Loved the post. We have all seen the photos in series mails that have the most awesome photos. I neve thought I will be able to visit it ever. Your post is the closest I think I will be able to get to it. The aroma of the jungle was printed on every whiff of breeze that I savored – lovely observation. I liked your comparison of water and land. Being an Aquarian i love the water – the rains, the beach. Though all from a distance since I cannot swim! Any trivia regarding the actual construction at that height and that too in 1690s? Kaka, finally finished the 3rd part today. Seems like reading is tougher than actually going there! As always, good detailing and nice personal touches to make the reading as enjoyable as the journey. Loved your take on the ‘water and land’ topic. May you keep travelling and keep writing. Exceptionally wonderful to read. One of the best travelogues I have come across in a long time. Hats Off ! Thank you Kaushik, glad you liked it and hope and pray that you are able to make it to the top sooner than later, specially now that William & Kate too have made it to the top during their recent visit to Bhutan. we r [ pune rangers group ] Planing Bhutan trip by road ..in diwali vacation can you help me ? Sir you literally make the reader walk through the whole experience… you have such an eye for the minutest detail… !! I am visiting Bhutan and Paro this April and hope your write up inspires us during trek to the Tigers Nest..!! Sir you literally make the reader walk through the whole experience… you have such an eye for the minutest detail… !! I am visiting Bhutan and Paro this April along with my daughter and hope your write up inspires us during trek to the Tigers Nest..!! Ghumakkar: You like to be called as DL. Multiple times you have requested (and reminded) people to address you as DL. Why ? What is the story behind this ? DL: Heh Heh. Well, Yes. Let me first affirm again that I wish to be addressed as DL. Just DL, nothing before or after. It makes me feel more warm, more closer. I do not like salutations and lets keep it that way. Well, as you would know, I am from Andhra Pradesh. My full name is Dhanalakota Lakshmi Narayan (धनालकोटा लक्ष्मी नारायण ). 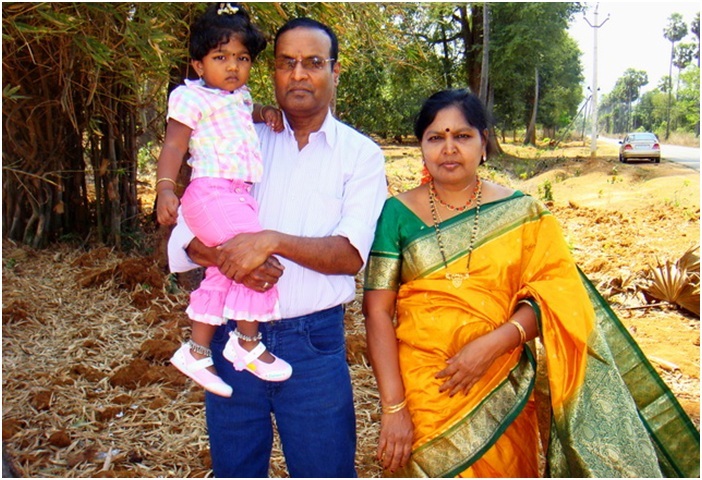 We use surname as a prefix and amongst the boys of my generation every other person in Andhra was either a Laxmi Narayan or some other Narayan. Calling just Narayan was even more confusing so my classmates started calling me DL and it stuck on. All through, my friends, my close peers, and now you and people at Ghumakkar call me DL. And that is what it should be. Lol.